Collings' fantastic double-cut semi-hollow with laminate construction! Loads of bite! Because of our special relationship with Collings we can get this as fast, or faster than anyone in the industry. In some cases, we even have preferred build slots we can offer you. Let's get down to the nitty gritty. This is a boutique version of the classic "ES" formula that outperforms the original. Confident feel, smooth and precise fretwork, punchy/bold tone from the Lollars...and that burst finish? Come on! How nice is that?! A welcome depature from the solid-top deluxe version. Laminate top prevents feedback and provides an authentic vintage tonal quality with modern reliability and even balance top to bottom. If you're looking for a humbucker style guitar as a foil to your strats then the I-35 is your starting point AND ending point! 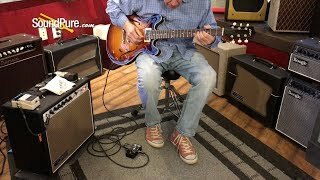 In this video, Sound Pure guitar specialist Eddie Berman tests out Collings fantastic double-cut semi-hollow: a used Collings I-35 LC Sunburst Semi-Hollow Electric #14523. If you're looking for a humbucker style guitar as a foil to your strats then the I-35 is your starting point AND ending point! The I35 LC is the result of a custom laminated construction technique that Bill Collings and his R&D team developed in pursuit of the best tonal qualities of vintage semi-hollow guitar design. When crafting instruments designed to be used electrically at higher volumes, the resonant qualities of a guitar need a high degree of focus to achieve some of the classic semi-hollow guitar tones. The I35 LC is the first of a line of laminate instruments designed to respond acoustically in perfect harmony with their electronics. Custom crafted in house for each guitar, the Collings laminate line has provided another unique way for us to voice our instruments for superior response and tone. The I35 LC features a custom laminate maple top, sides and back and an all mahogany neck. The I35 LC is among our most articulate and versatile electric models. Sound Pure is a proud dealer of Collings Acoustics, Electrics, and Mandolins, with a large inventory and new guitars arriving regularly. Each instrument in stock is professionally photographed, and we have video reviews with studio-quality sound and HD video quality. Bill Collings has been inspiring generations of guitarists with his fine guitars and mandolins since the 1970s. After dropping out of medical school to pursue his interest in guitar building, he moved to Austin, Texas where he and his company, Collings Guitars, operate to this day. From his humble beginnings as a one-man operation in a two-bedroom apartment to his current 22,000 square-foot facility and approximately 70 employees, Collings has built a reputation for producing high quality instruments with care and precision. Perhaps best known for flat-top acoustic guitars, Collings excels in a variety of classic-inspired designs and modern build concepts. Their D series guitars represent their take on the iconic 14-fret square-shouldered dreadnought and include the highly-favored D1 and D2H models with mahogany and rosewood back and sides respectively. These guitars are extremely well-balanced and have a strong reputation for reliability and consistently becoming stronger as the woods open up over time. The CW models in this series feature Adirondack tops, larger sound holes, and other specs especially coveted by bluegrass flat pickers for their volume and responsiveness. The Collings OM series guitars tend to be lively, balanced, and lyrical. These guitars are hugely popular amongst fingerstyle players for their dynamic sensitivity, size, and playability. One of the most versatile acoustic guitar designs, Collings OMs can also handle heavy strumming and flat picking easily when the player needs to dig in. The CJ is a fantastic slope-shouldered dreadnought, and the SJ is their incredible small jumbo design. Collings also makes astounding parlor-style 0, 00, 000, and Baby guitars, which are perfect for performance or travel and offered with the same variety of options as the larger lines for true customization of tone and appearance. Rounding out Collings’ acoustic lines is the C10, which is modeled after a parlor guitar but with a design concept that makes it a favorite electric players. Collings is ahead of the pack in the acoustic guitar game, but it certainly does not end there. Their electric guitars are highly regarded amongst players across the entire spectrum of musical traditions. Designed and built with the same knowledge and attention to detail as the flat-tops, Collings electrics are quickly gaining recognition as contending with the best of the best of electric guitars. Hard rockers and country pickers and everyone in between can find a Collings electric to fit their style, from the Les Paul-inspired shapes of the 290, 360, and CL series to the semi-hollow I-35s and SoCo Deluxe models. Collings also offers A and T-style mandolins, as well as concert and tenor ukuleles. Every Collings instrument has been built with the same standard of craftsmanship and quality that any discerning musician deserves to experience in the tools they select for their musical journey. At Sound Pure, we believe that the tools you equip yourself with can either enhance or hinder you on your journey, so we make it our job to research and choose what we find to be the very best instruments for our clients. We are confident that any Collings guitar that leaves the shop will meet their standards, as well as ours. If you find that we do not currently have the exact specs you need we are happy to make custom orders for our customers to build their own dream guitar.